When Monsanto picked a fight with the tiny, rural U.S. state of Vermont, it thought it would be a rout. It didn’t count on us. Earlier this year, Monsanto sued Vermont to block a law requiring the labeling of foods containing genetically modified ingredients. A costly legal battle could bankrupt the state, but Vermont didn’t back down. And with a big boost from SumOfUs members, they’ve raised almost a quarter million dollars to defend themselves against Monsanto’s bullying! But now a whole wave of corporations have joined the fight against Vermont as part of a shadowy corporate lobbying association — companies like Starbucks, Nestle, and Coca-Cola. So we need to step it up as well. Can you chip in $1 to help launch the next phase of our campaign to stop Monsanto’s bullying? 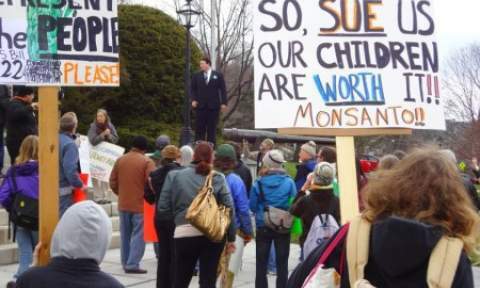 Yes, I’ll chip in $1 to help Vermont stand up to Monsanto’s bullying. This campaign is a complete game changer. Through the Internet, we’ve proven that people can stand up to multinational corporations and win. And that’s exactly why the Grocery Manufacturers Association — a huge corporate lobby representing Coca-Cola, Nestle, and Starbucks as well as Monsanto — is dead set on making an example of Vermont and forcing it to back down. But here’s the thing: Many of the companies joining the fight against GMO labeling are different from Monsanto. Monsanto can force farmers to buy their seeds and pesticides, but Starbucks, Nestle, and Coke are consumer brands, and people can choose to stop buying these products if they don’t want to. So we’re getting ready to launch a campaign to call out the shadowy Grocery Manufacturers Association and its members, and make it feel the heat for suing Vermont. If we can pry off even one or two of them from supporting this lawsuit, or force them to raise a storm inside this corporate lobby, the consequences could be huge. But we need your help. As Vermont Governor Peter Shumlin said in his letter thanking SumOfUs members for your donations to the Vermont legal defense fund, “We have a right to know what’s in the food we buy.” But if we don’t fight for our rights, we’ll lose them. Can you chip in $1 to help stop Monsanto’s legal bullying?